Vienna, 20 January 2017 – Since 1st January 2017 an emergency helicopter of the Austrian Mobile Association Air Rescue Service has been on duty around the clock for the first time. Detailed weather information for these night mission are provided by UBIMET. Lower Austria is the first Austrian province to enable medical service via helicopter also at night. 13 night rescue missions have already taken place at night since the beginning of the year. Special night vision goggles have been acquired for pilots and helicopters have been adapted for night service. While at first only the “Christophorus 2“ helicopter has been operating 24/7, gradually all pilots and winchmen will be trained to properly use the equipment. For this reason an innovative information system, a first in Central Europe, was developed in cooperation with UBIMET. Special types of analyses have to date permitted us to simulate the weather situation in the rescue area in real time and provide the data to our pilots. For ÖAMTC rescue service we are new also using cutting-edge satellite technology that enables us to see advection fog. By also integrating an even more precise lightning detection system that captures lightning three-dimensionally and registers also weak lightning activity in the clouds we have even more detailed and comprehensive lightning information at our disposal. “The WeatherCockpit does not replace the flight weather report, but we would like to provide pilots with additional information as well as a more comprehensive overall picture of critical weather areas and thus increase the safety of rescue missions “, emphasizes UBIMET CEO Michael Fassnauer. 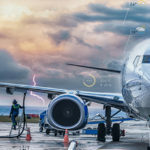 This UBIMET weather application was originally developed for Formula 1 and has been in successful operation at several airports both in Austria and abroad, such as for instance Frankfurt Airport. “With the WeatherCockpit our pilots may also access the most up-to-date weather data via tablet while they are in the air. This is particularly important when the helicopter cannot return to the flight base between missions “, Kraxner concludes.